Accessibility information: Wheelchair wide doorways - There is a side gate that leads directly onto the patio, with patio doors leading into one of the lounges. 2 twin & 2 single bedrooms, family bathroom and wc/shower room all on ground floor with kitchen & communal areas. Contact at Northcott Farmhouse on 01288 361 494 (mobile: 07813594056) or complete the enquiry form. Northcott Farmhouse is a traditional, characterful period Georgian farmhouse with 9 bedrooms, set in the heart of the 400-acre estate of the Trewin family. 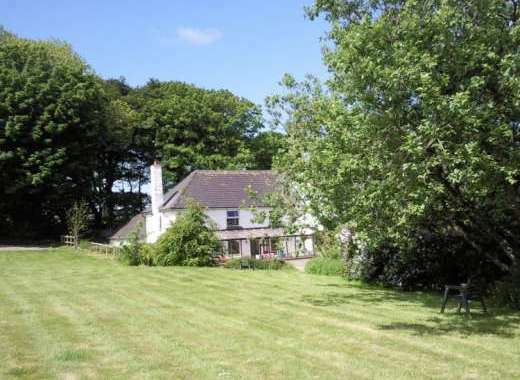 The North Cornwall coastline is accessible and the West Country holiday farmhouse boasts views across farmland and down the valley to the coast. The secluded location of the Cornish farmhouse makes it the ideal venue for parties and celebrations, and being just a short walk from Northcott Mouth beach also makes it perfect for family holidays, with plenty to see and do around the area. Two large lounges with Sky TV and DVD players mean you will never be stuck for something to do and WiFi throughout the property allows you to stay connected during your break. The first lounge is in traditional Georgian style with stunning views over the garden, exposed wooden floorboards, large TV and comfortable furnishings. The second lounge also has a large TV, as well as a woodburning stove for cosy nights in and features French doors which lead out onto the patio. The patio area boasts a barbecue which is perfect for entertaining, and unbeatable views right down to the sea. 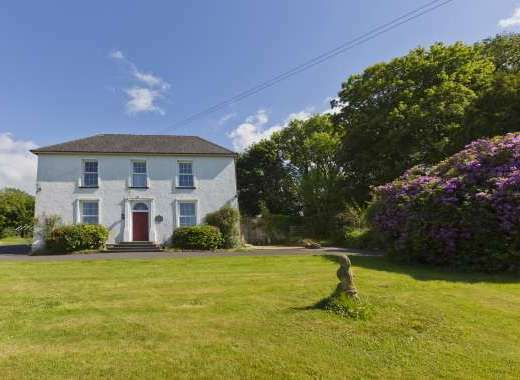 Northcott Farmhouse sleeps 17 guests across 9 bedrooms and with a total of 7 bathrooms. One of the double bedrooms has its own private ‘snug’ or sitting room, which could also serve as an additional lounge. The kitchen is large and well-equipped with everything you could need – a double range oven, huge fridge/freezer and dishwasher. The kitchen leads through to the dining room, which is ideal for hosting dinner parties with all 17 guests seated comfortably at the large traditional wooden table and a wood burning stove. The heated cellar has been converted into a games room, with a pool table and a good choice of toddler toys. Children will love staying at the farmhouse: alongside the outdoor play area, which has room for playing ball games and features a swingset and climbing frame. There are also some small farm animals to feed and pet, namely Kune Kune pigs in the paddock next door to the house, Bubbles the Dartmoor pony & Tiny Tim the minature shetland, Rosie the Donkey and Bella the horse to stroke and Milly the goat too. With its secluded location this house is perfect for family or group gatherings, now including intimate after wedding celebrations and we also welcome Hen and Stag parties. There is plenty of space to chill or party and the stunning Northcott beach is only half a mile away. Up to 4 well-behaved dogs are more than welcome. Need more room? There is also a 4 x bedroomed House and Cabin which can also be rented by arrangement just 800m away from the Farmhouse. Little Northcott House has 4 x bedrooms (also own hot-tub! 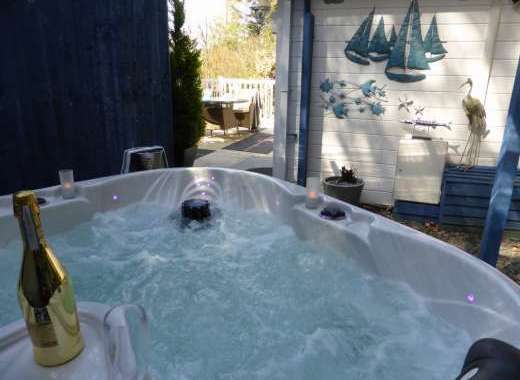 ), accommodating up to 8+pets and The Cabin (also with hot-tub) sleeps 2 guests. SHORT BREAKS BOOKINGS WELCOME (Except between Mid May to Mid September). 25% deposit required to secure a booking, full payment due 6 x weeks prior to arrival. All major credit cards accepted. Guests advised to take out own cancellation insurance. HALF A MILE INLAND FROM THE STUNNING COASTLINE WITH 5 EXCELLENT SANDY SURF BEACHES NEARBY. Explore popular Cornwall villages just a short drive away like Boscastle, Tintagel, Padstow, Hartland & Clovelly. Recommended Places to Visit: Eden Project, Padstow, Port Isaac, Rock, Boscastle, Hartland Abbey, Clovelly, Bodmin, Exmoor and Dartmoor. Several top quality gardens. 05 Apr 19 25 Apr 19 £3,900.00 Friday Please Contact Owner/Agency for more info. 26 Apr 19 23 May 19 £3,400.00 flexible " "
24 May 19 30 May 19 £4,400.00 Friday " "
31 May 19 27 Jun 19 £3,400.00 flexible " "
28 Jun 19 18 Jul 19 £3,900.00 Friday " "
19 Jul 19 29 Aug 19 £5,350.00 Friday " "
30 Aug 19 12 Sep 19 £4,100.00 Friday " "
13 Sep 19 26 Sep 19 £2,900.00 flexible " "
27 Sep 19 03 Oct 19 £2,350.00 flexible " "
04 Oct 19 17 Oct 19 £2,350.00 flexible " "
18 Oct 19 31 Oct 19 £3,900.00 Friday " "
01 Nov 19 19 Dec 19 £2,000.00 flexible " "
03 Jan 20 13 Feb 20 £2,000.00 flexible " "
14 Feb 20 20 Feb 20 £2,850.00 Friday " "
21 Feb 20 19 Mar 20 £2,000.00 flexible " "
20 Mar 20 26 Mar 20 £2,350.00 flexible " "
27 Mar 20 16 Apr 20 £3,900.00 Friday " "
17 Apr 20 21 May 20 £3,400.00 flexible " "
22 May 20 28 May 20 £4,400.00 Friday " "
29 May 20 25 Jun 20 £3,400.00 Friday " "
26 Jun 20 16 Jul 20 £3,900.00 Friday " "
17 Jul 20 27 Aug 20 £5,350.00 Friday " "
28 Aug 20 10 Sep 20 £4,100.00 Friday " "
11 Sep 20 24 Sep 20 £2,900.00 flexible " "
25 Sep 20 01 Oct 20 £2,350.00 flexible " "
02 Oct 20 15 Oct 20 £2,350.00 flexible " "
16 Oct 20 29 Oct 20 £3,900.00 Friday " "
30 Oct 20 19 Dec 20 £2,000.00 flexible " "